Last year, I loved seeing velvet come back as a trend. If you've walked through a mall lately or shopped online, you've probably seen that it's back and bigger than ever. And sometimes can be a bit pricey. Today, I'm sharing a few of my favorite velvet finds under $100. Happy shopping! I think I have overalls that are velvet. Guess I can pull those out if velvet is in style.I do like that shirt though too. Definitely. Makes you wish you saved your old stuff. Lucky! These are some lovely pieces. I really like the color of that boot. I don't think I own anything velvet. Thank you. I just started picking up some velvet pieces last month and am loving them. I see so many pieces that I need. Those booties are super cute. Love the color! Beautiful! I dont belive I ever have worn velvet! It must feel soft on the skin! But to be honest I am not sure I would look that great. Definitely soft. I'm loving buying more and more velvet pieces. Thanks for stopping by! The jury is still out about velvet for me. I like the tunic but not the shoes but I can see they are popular. The feel is usually on the outside, which is good. Velvet is definitely in for 2017. I have this cute velvet dress I wore a few weeks ago and loved it! Yes, I'm loving velvet. Can't get enough. Velvet is coming back? Terrific. I love the feel of velvet - so plush and huggable <3. Thanks for sharing your finds at <$100. Love it! That tunic is so pretty. It fits really nicely and the blush colour is lovely. 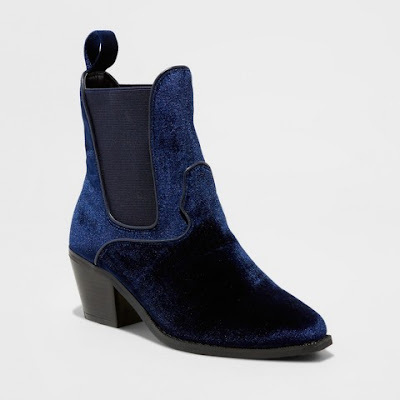 I really like the idea of velvet boots but I always worry about ruining them since I walk around the city a lot. The blush velvet mules have held up pretty well. I'm not sure if there's a velvet spray like there is for suede. I'm not a huge fan of velvet, but I do love those shoes! And the tunic looks great on you, I just don't think I can pull it off! You should try it. I really felt the same way until I caved and got my first piece (the tunic) and love it. Love the boot and dress you are rocking. I love your velvet tunic and those boots! Is velvet back in right now?! Gorgeous! You are rocking the look. Love the tunic and shoes, colors, and all.